Kim Lefèvre (1939?) is a Vietnam-born French fiction writer, memoirist and translator from Vietnamese into French. She was born in Hanoi of a Vietnamese mother and a French military officer whom she never knew. At 20, she emigrated to France and settled in Paris. Is it possible? 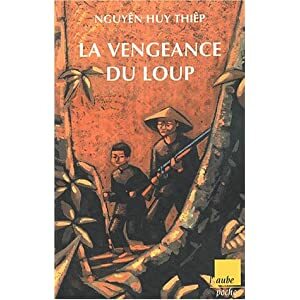 Nguyen Huy Thiep, one of Vietnam's most prominent writers, seemed determined to make it so. This is a collection of short stories; one is even set in 1975, yet there is no mention of the tumultuous events that are occurring around the characters. Most of the stories are straightforward stories on the concerns of village life. The first seven stories are set in Black Thai villages, in the northern part of Vietnam. The name is derived from the clothes they wore, and not their skin color. The Black Thais, along with numerous other similar ethnic groups, were lumped under the name "Montagnard," first by the French and later, the Americans. It means "people of the mountains." These stories are relatively simplistic, and portray villagers who are haunted by magic and superstition. The first story is the one that gives this collection its title, and concerns the raising of a wolf-cub at home, by a hunter who has killed its mother. The ending is all too predictable; indeed, the growing cub does obtain vengeance. Mlle. Bua concerns a woman with nine kids, and she is not sure who the father is on any of them... she was poor, but fortune shined upon her during one day in the forest, and now there are far more purported fathers than kids. Another story tells of the trials and tribulations that the village "head-man" places upon the suitors for his daughter's hand, all in an effort for her to obtain the best one. The next concerns a cholera epidemic, and how a gambling addiction spares the life of one member of a village. The final story concerns a couple who recently move to the edge of a village; he is a hunter, and must deal with the diminution of game in the surrounding forest, and the pursuit of the "biggest game," with tragic consequences. In general, these seven stories are morality tales drawn from daily village life. In the second portion of the book there is a shift in style and length to the stories. Each is much longer. The first though does relate to villagers and superstition, but there is a "Tom Sawyer" coming-of-age quality to it, in which a youth is initiated into the rhythms of work by river fisherman, and the myth of the black buffalo which lives in its depths. Then there is a story that could have been in the "New Yorker." Two women talking in the café, as the rain pours down, about men, and how sorry they are, except when they are not around. The worst fate is for some other woman to steal one of these sorry men. Another quite "modern" story deals with the economic disparity between the rich and the poor, and the hope that a lottery will resolve the latter's impecunious state. Thiep tosses in bit of "cougar" love to the tale. The last two stories involve a paean to village life, and then a complex tale, with some dramatic tension, concerning a simplistic lad who cannot make it academically, but is enchanted by a "water sprite." He wanders the countryside, using his strength in doing odd-jobs, with a goal of ultimately seeing the sea. It really did underscore to me how rooted, and non-travelled so many villagers were in Vietnam. Overall, some quality stories, and an important perspective on a Vietnam that is not at war. The quality is uneven however, and may contain too much folklore and superstition (though that is the way it is) for some readers. 4-stars.